The first people to climb Mount McKinley did it to win a bet. It all started when a group of guys were talking in a Fairbanks saloon one cold November in 1909. Dr. Frederick Cook had just published a book claiming he made it to the top of Mount McKinley. Those at the bar were all convinced the famous explorer was lying. Alaskans didn't believe some fancy man from the city could have done it. The bar owner said he didn't believe anyone could do it. Tom Lloyd took the bait. He was a miner who had spent more time around the mountain than almost anyone. He bragged that he knew how to get to the top. The bar owner told Lloyd he was too old. Lloyd told him, "I may be, but I can find men who will do it." That settled it. The bar owner put up $500 to prove Cook didn't make the climb. Once the newspapers got hold of the story, there was no backing out. The 50-year-old Lloyd got together a team of fellow miners: Billy Taylor, Charley McGonagall, and the Swede Peter Anderson, to tackle the mountain. This group had mined for gold at Kantishna at the base of the mountain. They knew the area as well as anybody. In December they left Fairbanks with four horses, a mule, and a dog team. They headed south toward the mountain. After the record cold November, temperatures had warmed to 40 degrees, setting record highs by mid-December. By early February, they finally reached Kantishna. They set up a base of operations at the mouth of Cache Creek. From this spot at about 2,900 feet in elevation, they started scouting routes up the mountain. Based on his previous experience, Lloyd was convinced that the only way to make it up the mountain was to follow the Muldrow Glacier, which they called Wall Street Glacier because it had such high walls on each side. The climbers used no ropes or other climbing gear. The most technical equipment they had were snowshoes, handmade crampons, and long poles with steel hooks they thought would keep them from falling into crevasses on the glaciers. They wore bib overalls, wool long underwear, insulated rubber boots, mittens, shirts, and light parkas. They brought with them bacon, beans, flour, dried fruit and coffee. They caught fish and killed caribou at the lower camps and carried it up the mountain. They started out with a barometer to figure out their elevation, but they lost it. The only other equipment was a camera, a watch, and a thermometer. They cut and burned firewood for cooking at the lower elevations. They planned to use a small oil stove on the climb. But they decided not to use oil and simply chopped wood into small blocks they could use in the stove. That decision turned out to be a good one, since the oil would likely have frozen in the subzero temperatures. They also hauled a 14-foot spruce flagpole they wanted to plant at the summit to prove they made it to the top. In all, while they claimed they were traveling light, by today's standards they had a lot of heavy, bulky gear. The horse and mule helped them get the gear to Kantishna. Dogs helped them freight the load up the mountain. "We had two caribou hides for beds and mattresses for four of us. Pete had a mountain sheep skin sleeping bag as well, and besides that we had three robes in all for the four of us, one of them was not much good, and a piece of canvas to throw under all. You want to be sure and keep the snow and ice from thawing underneath you. We had no discomfort in sleeping, none at all," Lloyd wrote in his journal. By early March, Lloyd, McGonagall, and Anderson began heading up the Muldrow. Taylor had gone back to catch some fish. By March 11 he caught up with them. Taylor, the youngest member of the team, made several trips back to their camp at Cache Creek for wood and meat throughout the expedition. Storms slowed them down. But on March 18, they made it to about the 15,000 foot mark. Here they set up what they thought would be the final camp before making the summit. They spent the next two weeks carving steps in the snow and ice up the mountain, then coming back to camp. Lloyd went back to their main base camp for more supplies on March 29. After this, there is speculation about what Lloyd did. On April 1, the group made their first attempt to reach the summit. A storm turned them back. On April 3 they tried again. Carrying a bag of doughnuts, three thermos bottles of hot chocolate, some caribou meat and their 14-foot spruce pole, Taylor, Anderson and McGonagall headed to the summit. Taylor and Anderson reached the North Peak summit. They built a pyramid of rocks and used ropes to anchor the spruce pole to prove their victory. McGonagall did not feel the need to get to the top. He said he had finished his turn carrying the pole and so he rested for awhile and then headed back to camp. Some believe that Lloyd suffered altitude sickness and stayed back at the base operations while the others climbed to the summit. Unfortunately, he couldn't face his own failure. He claimed that he had been with the summit team. He fictionalized his journal account of the summit attempt. His lie made everyone question whether anyone had made the summit. He did tell the truth when he wrote, "I wish to state emphatically that I, personally, could never have got any place if it hadn't been for Pete Anderson, Charley McGonagall, and Bill Taylor. I wish to here publicly acknowledge that they were far superior to me in ability at any stage of the climb, up or down or on the level. They did the work, before and behind, and I kept camp." Still, his lies caused doubt for years. Several attempts to prove or disprove the claim were made. In 1913, members of Hudson Stuck's expedition spotted the flagpole as they climbed to the South Peak and put to rest all doubt about the incredible feat of the hardy Sourdough climbers. The Sourdough Expedition: Stories of the Pioneer Alaskans Who Climbed Mount McKinley in 1910 edited by Terrence Cole, Alaska Northwest Publishing Company, 1985. To the Top of Denali by Bill Sherwonit. Alaska Northwest Books, 1990. Charlie McGonagall and Sourdough Expedition leader Tom Lloyd at the 16,000 foot camp on Mt. 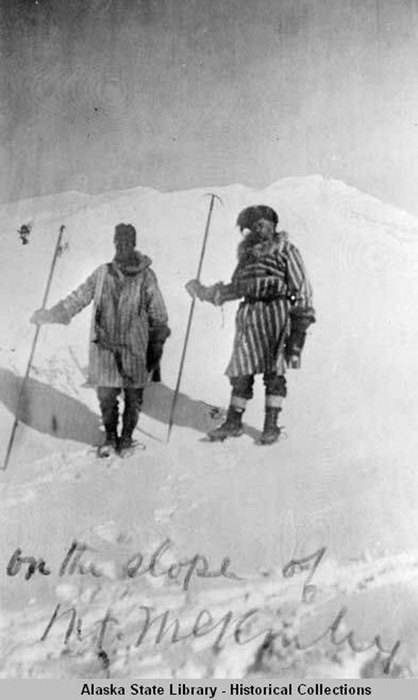 McKinley during their 1910 ascent of the North Peak.